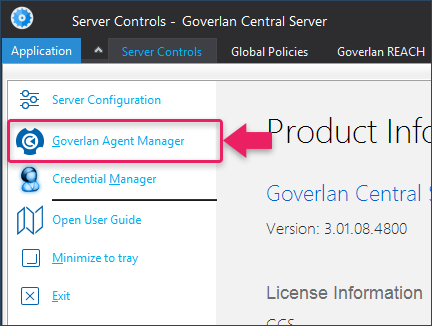 The Goverlan Agent Manager is used to deploy, update or remove the Goverlan Client Agent on one or more remote machines. It can also be used to push some configuration to these systems or generate a stand-alone client agent installation package. Click on the Add button (+) to add groups of remote machines. You can retrieve computers from local Active Directory domains, IP ranges, external sites, or by manually entering a computer IP address, NetBIOS name or FQDN. Once the scope of computers defined, the Goverlan agent status is displayed for each of these nodes. To perform an action on one or more nodes, select them in the main view and click on the desired action at the bottom of the window. You can use the SHIFT or CTRL key to define multiple selections. Click on Install/Update Agents to equip the selected nodes with the latest Goverlan Client Agents. Agent update can be executed on machines that are within, or external to your organization. Click on Remove Agents to uninstall the client agents the selected nodes. If some of the selected nodes have legacy Goverlan Agents installed, you will be prompted for which version of the agent to remove. Removing client agents on nodes that are external to your organization will make these nodes unreachable. 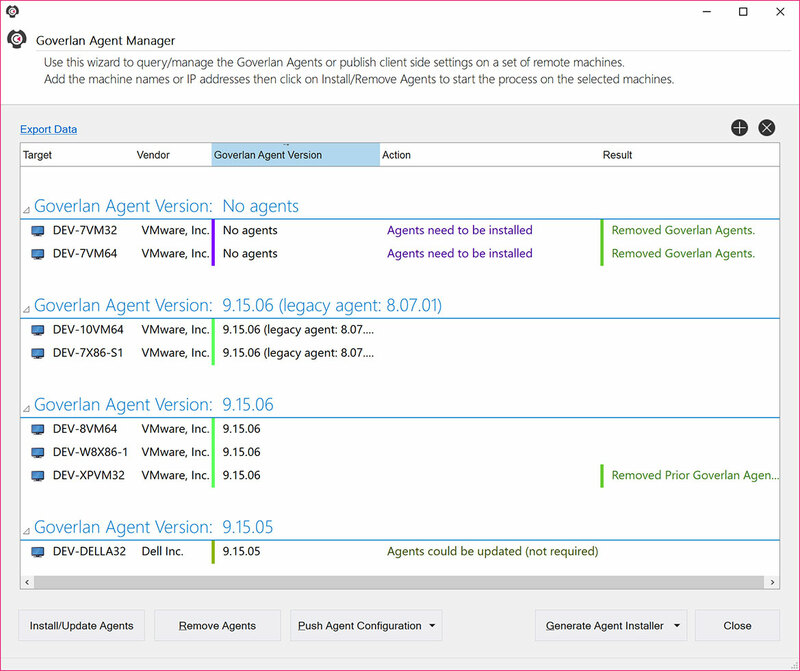 Some basic agent configurations can be pushed using the Goverlan Agent Manager. You can define the Goverlan Reach Server that the nodes should use to acquire policies and push audits or define the behavior to adopt during a remote control session. However, pushing agent configuration via the Agent Manager is for advanced troubleshooting or configuration purposes. It is recommended to use the standard method to advertise your Goverlan Reach Server on your network, then use Goverlan Policies to dictate behavior configuration. Click on the Generate Agent Installer button to create a stand-alone installation package. Using this feature, you can create a 32-bit or 64-bit MSI, or EXE. If the Goverlan Reach Gateway Services are enabled, you will also be able to generate an On-Demand Assistance package. These packages allow for an on-demand assistance session to be opened from any machine over the internet. Select the category you wish to configure, enable the Configure These Settings option and configure your options. 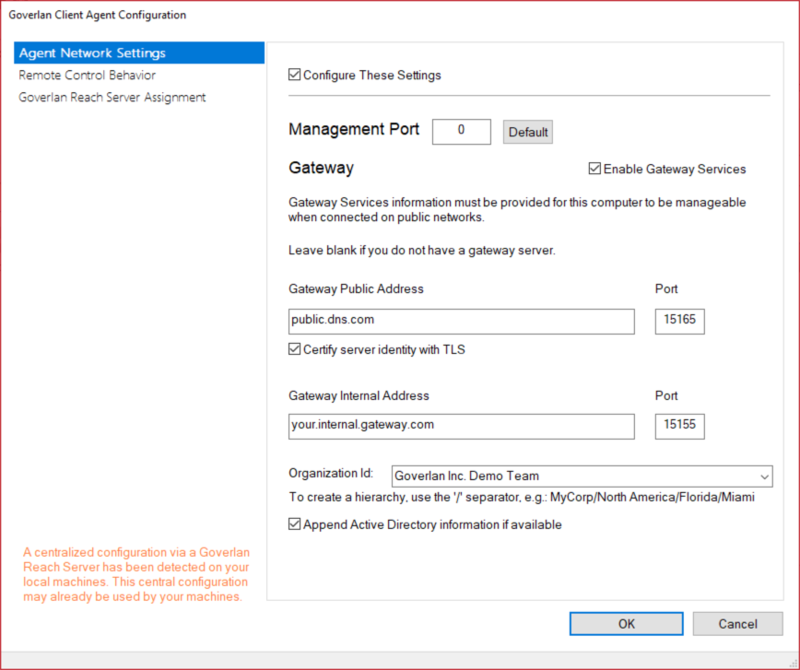 If the client agents are installed on machines that are under the influence of a Goverlan Reach Server with Policies, your agent configuration may be overwritten.